October 16th - DC Net Impact (DCNI) 2012 Speed Networking: DC Net Impact's annual Speed Networking event is a chance to learn about career paths and opportunities in sustainability and social impact. 4GreenPs' Lynn Anne Miller participates as a "celebrity networker" and green marketing resource. 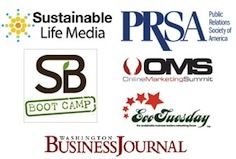 September 30th - Green Festival DC: Lynn Anne Miller speaks on "Crossing the Green Chasm: Marketing Green to the Mainstream." Too many mission-driven green entrepreneurs struggle to expand their businesses beyond "the deep green core." Why is this? Learn how to overcome the common mistakes green businesspeople make when trying to reach beyond the 16% of Americans who self-identify as "green." September 19th - Careers in Marketing Panel: Lynn Anne Miller speaks on a panel for MBA students at the University of Maryland's Smith School of Business. September 6th - IPRA Speaker Luncheon: IPRA Board Members Susan Rink, Jeff Ghannam and Lynn Miller lead a roundtable discussion on using Google+ and other social media platforms. April 17th - The Greater Bethesda-Chevy Chase Chamber of Commerce: Lynn Anne Miller speaks on "Opportunities and Pitfalls of Green Marketing and Corporate Social Responsibility" at a breakfast presentation on "How to Get the Most Out of Greening Your Business," a partnership of The Greater Bethesda-Chevy Chase Chamber of Commerce and Bethesda Green. September 28th - Washington Business Journal, BizSmarts Expo 2011: Lynn Anne Miller will appear in the panel discussion "Corporate Social Responsibility: Fortune 500 Company Best Practices for Small Business." April 7th - Public Relations Society of America (PRSA), National Capital Chapter, Independent Practitioners Alliance: Lynn Anne Miller led a discussion about “Digital Media Strategy for PR Practioners.” Read coverage of the event by The Fletcher Prince Blog and at The Capital Communicator. October 23 - Green America’s Green Business Conference at GreenFest DC, Washington Convention Center, Washington, DC. Join 4GreenPs’ Lynn Anne MIller and her clients FreshFarm Markets and Mom Made Foods for a panel discussion on “New Social Media: Turning It Into More Business!” Session runs from 3:00 to 3:45 p.m., details here. August 17 - CEO Focus Annual Retreat, Beltsville, MD. GreenPs’ President Lynn Anne Miller joined a panel of marketing experts invited to address this gathering of local business owners running businesses with between $2 – $10 million in annual sales. July 13 – Public Relations Society of America 4GreenPs’ President Lynn Anne Miller led a brainstorming workshop about Social Media and Public Relations for PRSA’s Independent Practitioners Alliance, National Capital Chapter. She focused on Twitter and online video during crisis communications scenarios, using real-life case examples and posing “what if” scenarios. July 12 – Online Marketing Summit, Washington, DC Lynn Anne Miller spoke on a Keynote Panel about how emerging trends in Online Marketing are affecting campaign efforts and gave tips on how smart marketers can stay ahead of the curve, introducing the concept of “on-demand e-newsletter publishing” to the audience. April 10 – Green Social Media Panel Sponsored by EcoAlign: Driving Sustainable Product Growth – Lynn Anne Miller joined a panel of five DC green marketing experts moderated by energy and environmental politics reporter Kate Sheppard of Mother Jones. Check out this Vimeo video for excerpts. February 26th – Sustainable Brands Bootcamp Webinar: Social Media & Blogging, Lynn Anne Miller delivered a session entitled, “Green Bloggers: Don’t Call Us Mommy Bloggers.” She discussed digital public relations for sustainable brands, providing an overview of engagement tactics and tips for how both global brands and small start-ups can implement tactical plans that are time and cost-effective. She also presented case studies of blogger outreach programs. See a video out-take below. Full viewing requires registration at Sustainable Life Media. October 6th – DC EcoWomen: Lynn Miller joined a panel discussion on “How to Buy Green,” which included her client Bernie Prince, co-founder of FreshFarmMarkets and Emily Wurth, Water Campaign Manager for Food and Water Watch. June 11 – Cool Twitter Conference, Washington, DC Lynn Anne Miller spoke about “The Green Gold Rush on Twitter,” at the kick-off conference of the nationwide “Cool Twitter Conference” tour. November 18th - EcoTuesday, DC Chapter: “What’s the Big Deal About Social Media?,” In this presentation, Lynn Anne Miller counseled DC area sustainability professionals about how to use social media to connect to the larger green community. November 6th - Public Relations Society of America (PRSA), National Capital Chapter, Independent Practitioners Alliance: Lynn Anne Miller presented a talk about “How the Going Green Trend Affects PR,sharing her unique insights as both a long time PR practitioner and a popular green blogger on the receiving end of pitches from some of the top global PR firms. My Business Is On Twitter! Now What?? Book Lynn Miller to Speak to Your Group About Marketing or Sustainability Issues.